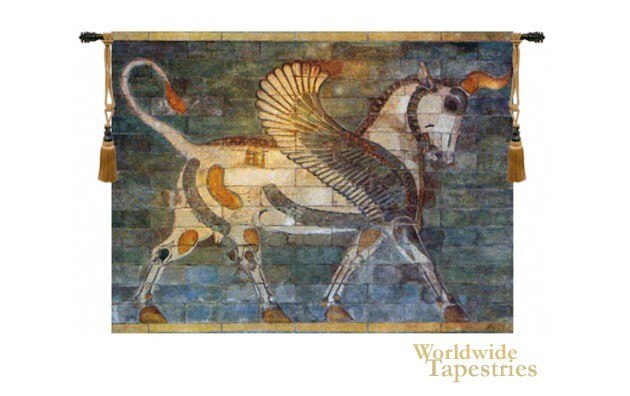 This Winged Bull tapestry shows the creature decorating the palace inspired by King Nebuchadnezzar in Babylon. Built by Darius I at Susa, this palace contains various creatures both real and imaginary. Contrasting against the blue walls of lapis lazuli stones, we see the white and gold winged bull creature, which is a symbol of protection for the royalty. This tapestry is backed with a lining and a tunnel for easy hanging. Note: tapestry rods and tassels, where pictured, are not included in the price. Dimensions: W 47" x H 35"
Dimensions: W 79" x H 59"